For some reason this looks larger in photos. I expected it to be a little larger than a pack of cigarettes, but it's really just a little thing--maybe 1/3rd the size. 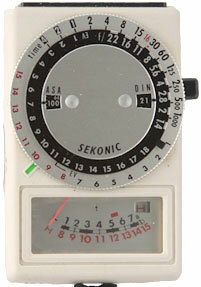 I like Sekonic—they made a lot of very good meters. But they made some junk and this is a prime example. I still don't know why they felt compelled to make it. It's basically the same concept as a Weston 617 from the mid 1930s: there's a meter scale at the bottom and a disconnected calculator wheel. The only advantage is that this has a CdS cell. Scale readings are great but the scale needs to be long, and this is pretty tiny. For my money, you could get a Sekonic L-98, which also CdS and has match-needle operation, which is a better system on something like this. The L-98 is a little larger and heavier, but not enough to matter. Seriously, if it didn't say Sekonic on it, I'd have sworn it was Russian or behind-the-curtain somewhere. They were always 20 years behind.